The box is nice, clean and handle built into the box, the type of efficiency you expect out of European design. You open it up to find a shoe that will only fuel your desire to go out and race so I immediately to put them on, in my bed and sent another photo to a fellow OCRADDICT, Desiree, because stirring up trouble is what I like to do, and nothing stirs the pot for an OCRADDICT like a new pair of shoes. 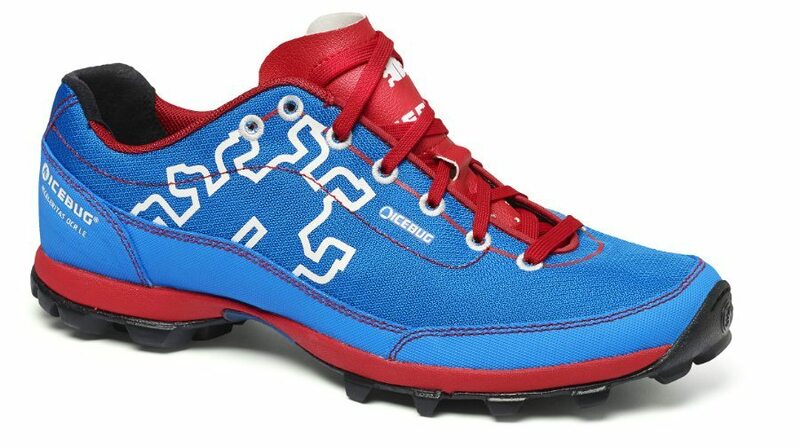 Constructed on a low volume, narrow last, the Accelerates OCR RB9X has a minimal drop and strategically placed cleats, creating a close to barefoot sensation and stable base, ideal for quick and safe progression through obstacles. The RB9X rubber compound provides superior traction on both dry and wet surfaces and the outsole pattern has the ideal design for even gripping mud. The upper is highly durable, to withstand the severe conditions of heavy usage, but is at the same time remarkably light. As the water pick-up is minimal, the weight is almost as low as when the shoe is dry. With a minimal cushion and a low sole profile the ground control is outstanding. RB9X is Icebug’s answer to the OCR conundrum. This is their latest rubber compound and it sets a new standard in providing friction and grip. 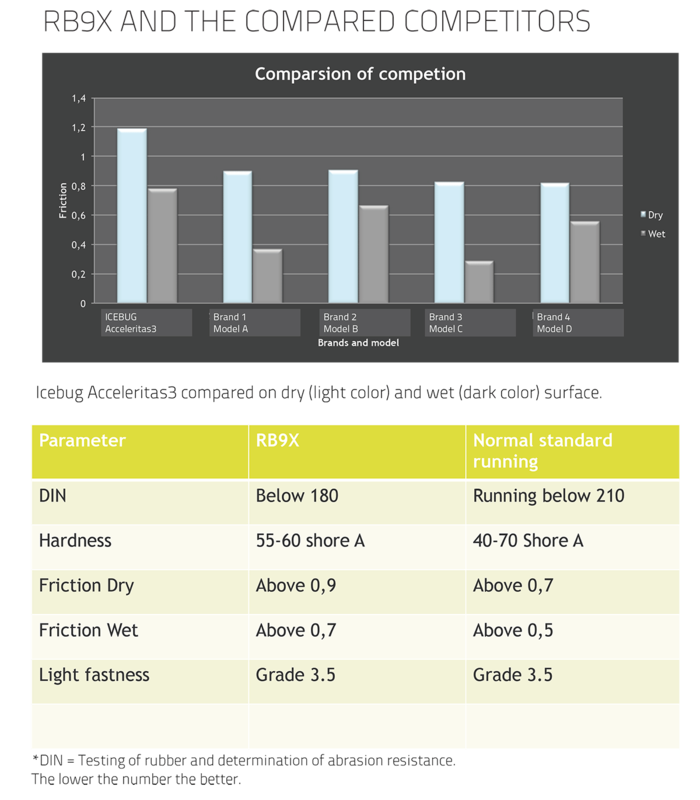 Independent lab tests (conducted by SATRA) demonstrate that RB9X can out grip the competition and still match the durability of road running shoes. The RB9X platform demonstrates that it will offer grip on rocks, concrete, wet grass, etc. Unfortunately, the study outlined on Icebug’s site does not indicate which shoes the RB9X compound was tested against. Having learned from my first pair of Icebug’s, I took out a garden hose soaked my feet then proceeded to mow my lawn to start breaking them in. Like their siblings, they were comfortable from the start. As some of you know, I’m a big fan of the Inov-8 X-Talons 200s (ran the Killington UB in them). The only way to describe the Acceleritas is if the Zeals had a love child with the X-Talon’s this is what would come of it. They are truly a comfortable race shoe. Nice and light but more forgiving on sharper surfaces that the Zeals; digging in with a similar intensity. Additionally, they will dig in nicely into a rope to help you get on up of you have issues with footing. Once broken in, they are extremely smooth, they have the type of cushion that makes you want to wear them even if you are not running. Similar to the Zeals in race conditions, they drain water very well. Even soaked, they will quickly shake off the water and put on only minimal weight. The grip is insane; I’ve had metal spikes that could only dream of gripping the ground the way these bad boys do. The grip is strong, almost to a fault. They grip so well that they held on to clumps of mud at times. They’d shake it off quickly, but it is a surprising level of grip performance. They clean off remarkably well going from caked brown to like new blue after few minutes with a garden hose. There was only one con I could find in these shoes, and it maybe my foot that caused it. My left foot is flatter than my right; as a result, more of it rubs up against the back of my shoes. This caused some nasty heel blistering when I ran in my no show socks. After breaking them in and wearing a thicker sock, the issue went away. It is hard for me to blame the shoe, but the back is a quarter of an inch taller than the Zeal and X-Talons, or the same height as the Reebok All-Terrains. I get the hype, my experience with the Acceleritas OCR has been a positive one, and I would encourage you to give them a look. They are on site at every Terrain Race in 2016, as if you needed another excuse to give that series a try. They will also be at select BattleFrog, OCRWCs, and Conquer the Gauntlet. They are a shoe that provides solid value, fantastic comfort and solid on course performance, what else could you possibly want from a race shoe? Let's face it, there are few things that an OCRAddict will usually have more than they need. For some, it is pants, others, shorts. For me, I have more shoes than I know what to do with. I don't know what it is, but I just can't rest until I have tried them all. 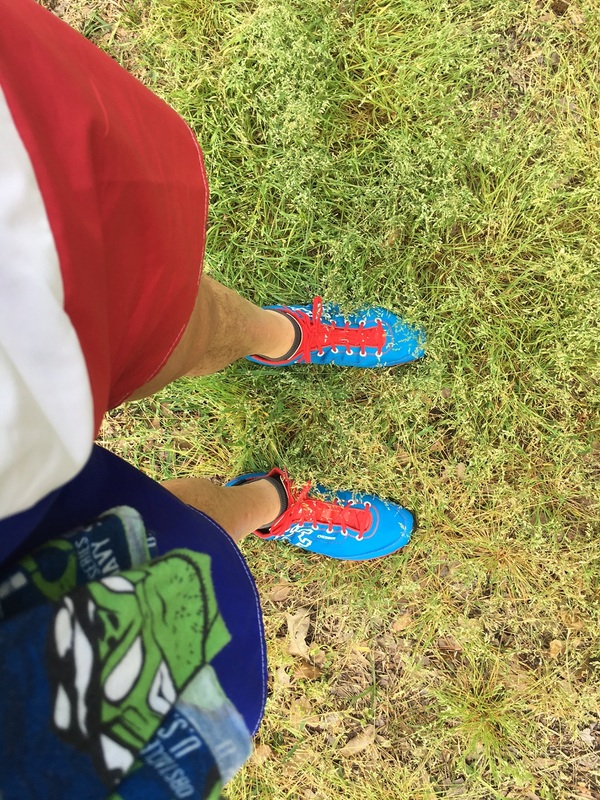 I do have a goto pair for certain races, but Altra thinks they have a shoe that can take the top spot and provide me with a shoe that can tackle it all. Enter the Altra Superior 2.0.